Lawrence High played a sloppy game fumbling the ball four times (losing two) and throwing two interceptions, but in the end they were able to hold on for a three-touchdown victory. The Chesty Lions capped off their first two drives with two-yard touchdown runs from Charles Jackson to claim a 14-0 lead (Jackson suffered what appeared to be a pretty severe injury later in the game and was carted off the field). Late in the first quarter Brad Strauss connected with Anthony Buffalomeat on a 35-yard touchdown pass to push the lead to 21-0. In the second quarter an LHS fumble set up Leavenworth to score on a 49-yard touchdown run from Jason Randall. LHS responded before the half with another touchdown pass, this time a 13-yarder from Strauss to Drake Hofer. The Chesty Lions led 28-7 at halftime. In the third quarter Leavenworth narrowed the LHS lead to 15 points when Anthony Truelove recovered a fumble and ran it back 55 yards for a touchdown, making the score 28-13. Lawrence was able to hold off the late surge, and closed out the game with a 12-yard touchdown pass from Strauss to Buffalomeat late in the fourth quarter. Running back Kendall Kelly's decision to transfer from SM North to Olathe East this year is looking like a pretty solid decision. Not only have he and the Hawks reeled off three-straight victories, but Kelly is starting to put up the big numbers he's capable of. Olathe East left no doubts early, scoring three rushing touchdowns in the first half to gain a 21-0 lead at halftime. The scores came on a two-yard run from John Kelsh, then runs of 10 and 15 yards from Kelly. In the second half Olathe Northwest got creative on a running back pass from Connor Middleton to Williey Cauley which resulted in a 31-yard touchdown score. Olathe Northwest trailed 21-7, but that was about as close as they came throughout the night. Olathe East's John Blazevic found Junior Williams on a 22-yard touchdown pass to make things 28-7. Olathe Northwest came back with a drive and a one-yard touchdown run from Middleton to pull to within 14 again, but then Olathe East poured it on to close things out. The Hawks scored first on a two-yard run from Kelly, then recorded a safety, then running back Hayden Frazier took a carry 40-yards for another score. Olathe Northwest's final points came late in the fourth quarter on a four-yard run from Middleton, his third touchdown of the night. Another week, another blowout victory for Olathe North. The Eagles are cruising through their schedule with ease as they put on yet another route Friday night. Olathe North opened up with three straight touchdowns on runs of three and 38 yards from Orange Mooney, and a 25-yard touchdown pass from Jordan Bruce to Tanner Gentry. SM South finally answered with a five-yard run from Gabe Guild to make things 21-7. Olathe North hit the accelerator again, scoring three more touchdowns in a row. The first on a four-yard run from Treshawn Root, the second on a 17-yard pass from Bruce to Willie Helig, and the third on a 71-yard run from Mooney. Olathe North led 42-7 at that point in the third quarter. From there, the scoring was back and forth. SM South added touchdowns on a 61-yard run from Guild and a 21-yard fumble return for a touchdown by Adolph Matthew. Olathe North's scores came on two touchdown runs from Elbert Johnson, his second going for 72 yards. Olathe South continues to come up victorious, this time claiming a Saturday afternoon contest on their homecoming. SM East scored first in the game on a four-yard run from Jeff Cole to go up 7-0. Olathe South responded that quarter with 75-yard touchdown run from Matt Elliott to even the score. SM East scored once more in the first quarter on a 27-yard pass from Nick Pirotte to receiver Connor Rellihan. Olathe South came back with a drive and a one-yard touchdown run from Chris Wright to tie things again. Perhaps the play of the game came just before the half when Olathe South's Elliott intercepted a Pirotte pass and took it back 79-yards for a touchdown. The Falcons missed the PAT, but went into halftime up 20-14. SM East put together a 12-play drive that ended with a three-yard run from Cole to begin the third quarter. The score put the Lancers up 21-20, but it was the last lead they would hold in the game. Olathe South came back in the fourth quarter with a 68-yard touchdown strike from Frankie Seurer to Drew Johnson. Later in the fourth the Falcons' Jared Douglas booted a 27-yard field goal to go up 29-21. Free State appears to have found their offensive mojo. The Firebirds torched the SM Northwest defense for 516 yards, with 445 coming on the ground. Free State added three rushing touchdowns in the first half--a 14-yard run from T.J. Cobbs, a 15-yard from from Kyle McFarland, then a 10-yarder from McFarland. SM Northwest kept the game honest with a touchdown run of four yards late in the second quarter by Danny Manning. Free State led 21-7 at the half. In the third quarter McFarland added his third touchdown of the night on a 50-yard run to give Free State a 28-7 edge. Shawn Knighton added a four-yard touchdown run, then followed that up with a 51-yard touchdown run midway through the fourth quarter to give the Firebirds 42 points. It wasn't pretty, but SM West managed to capitalize on a few first-half turnovers from SM North to gain a lead and ultimately claim the victory. SM West scored first when Brett Sterbach took a carry 32-yards for a touchdown, giving the Vikings a 7-0 lead. SM North fumbled the ball on their next offensive possession, and SM West's Sean Dilley scooped up the ball and took it 26 yards for a touchdown, giving SM West a 13-0 lead. SM North fumbled yet again on another possession in the first quarter, and that was recovered by SM West's Lee Spight who took the ball back 22 yards for a second defensive touchdown. The score gave SM West a 20-0 lead. SM North was able to cut into the lead with a six-yard touchdown run late in the first quarter from Brock Burrows. The Indians added another touchdown in the second quarter on a 22-yard pass from Ryan Theis to Mason Perez, which pulled SM North within seven, at 20-13. That, however, proved to be the last score of the game for either team as SM West came away with the win. If this is the Vikings 'bouncing back', I'd hate to see them 'staying down'. 6 turnovers in a meager 7 point win over a poor SMN team. Very poor performance. I'm beginning to think Coach C has lost control of this team or is not teaching basics anymore. These kind of errors did not happen in the Tyler/Blake Lawrence days or for that matter in the DJ Balasz/Darren Harvey days. Combine that pitiful performance with SM East's loss to O South and the Cougs blowout loss to a mediocre Free State team and the future of SM District football looks almost too dismal to bear. One more chance this week as we renew perhaps the most heated rivalry of the last decade when SMW takes on OE. I don't have much hope though. Sadly, these teams have only met once since 2007 and the intesity of the rivalry, which in recent years has been marked by the teams missing opportunities to play by losing early in the playoffs, may be lost. I'll post a review of the OE/SMW rivaly later this week. Go Vikes, Beat East! 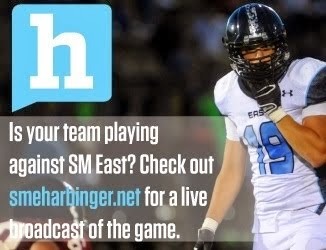 SME has struggled of late, but lost 2 games to two good teams in OS and OE by one possession. 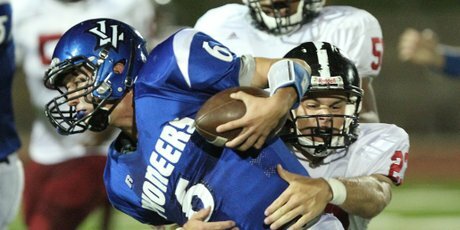 East should win in Lawrence this week and get back on track to win Districts and Contend in Playoffs. ON is clearly the powerhouse yet again. But very beatable. SME losing again....yahnnnnnn!!!! When will everyone realize that they are a mid tier team lacking depth and diversity within their offense. SME were the only ones creating their own hype before the season. I dont feel that ON is a "beatable" team. So far they have taken out almost every single team on their schedule that had any chance of winning. Olathe South probably has the best chance of beating ON before the playoffs. However, I don't believe ON will take OS too lightly after an inevitable blowout against Leavenworth. The only chance that ON will lose is in the playoffs, and that is still very unlikely. I wouldn't get too overconfident, sniper. You might want to check out Wichita Heights' scores for the year so far. Much more impressive than ON so far. Eagles best in the East for sure but I don't think anyone is going to touch Heights this year. Sorry about that, I was talking about just the East side of the playoffs, I think it's too early to tell which of the schools is better yet. All roads lead to Wichita Heights. Through four games they've outscored their opponents 229-28.